Enzymes are proteins that can speed up reactions. Enzymes participate in all processes in our bodies. As you are reading this article, your cells are still actively working. Your brain cells are firing electricity, sending signals back and forth. Your eyes are moving from sentence to sentence. Your muscle cells are helping to keep your body upright. The immune cells are patrolling the bloodstream. Other cells are constantly producing something, destroying something, dying, dividing. There is always some activity afoot. And that means multiple chemical reactions are taking place every second. But reactions in the cell are different from the experiments one undertakes in the laboratory. When we want a reaction to take place, we take certain ingredients, add them to the same space, create favourable conditions (for example, heat up the vial with them), and then wait for the result. And these things usually take time. But the living cells cannot wait. They need those processes to happen NOW, and as quickly as possible. That is why they need special substances that speed up reactions. Such substances are called catalysts. And the most powerful chemical catalysts that the cell has are called enzymes. A model of an enzyme. Credit: Bradshaw et al. But if we unravel this complex structure, we would see a long chain made of similar-looking building blocks. The building blocks of proteins (including enzymes) are called amino acids. There 20 amino acids that compose our proteins. All of them are encoded in our genetic code – DNA. The properties of amino acids allow these long, straight chains to fold up in complex structures similar to the picture above. And these strange shapes are the key to how enzymes help speed up reactions. When the enzymes are folded up properly, special areas are created called active sites or binding sites. Certain molecules can get attached to these sites. Active sites are highly specific. They fit only particular molecules: for example sugars, ions, amino acids or DNA. Such molecules are called substrates. If the “right” molecule comes near the enzyme, it gets attached, and the reaction can take place. It is similar to the way the key fits your lock: when you use the proper key, the lock turns and the door opens. If the key is wrong, you will not be able to enter. The lock-and-key model is the most popular description of how the enzymes act. The chain of amino acids folds into a particular shape, forming an active site. This active site fits a specific molecule called a substrate. 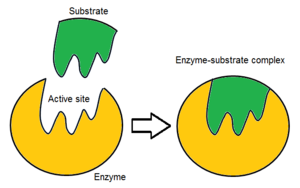 When the substrate binds to the active site of the enzyme, a reaction can take place. Reactions that are carried out are insanely fast. For example, there is an enzyme that transforms carbon dioxide, CO2, into carbonic acid (H2CO3). It is called carbonic anhydrase. It is one of the fastest enzymes known – one reaction takes up 5 seconds. Without an enzyme, this reaction would take up 106 as long! Carbonic anhydrase is an enzyme very important to our breathing – without it, the process of exchanging CO2 and oxygen in the lungs would take a very long time. Enzymes are efficient workers, but they need proper working conditions to do their jobs. Each kind of enzyme has its own temperature at which it works best. If the temperature of the environment is too low, the protein would not work well (or at all). If it is too high, the enzymes unravel and stops working – this process is called denaturation. 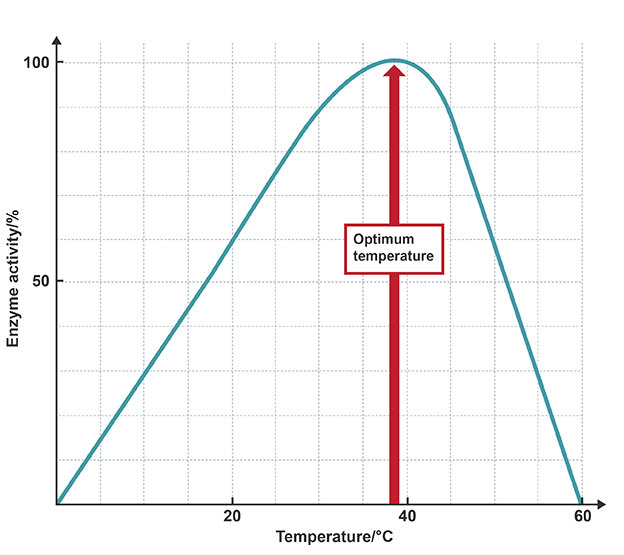 Only at an optimal temperature can an enzyme work most quickly and effectively. pH level of the environment is another important condition. Each enzyme also has a pH that is best for it. Some enzymes can only work in highly acidic conditions (some digestion enzymes, for example). Others need a neutral pH. Incorrect pH can also lead to the enzyme denaturation. The enzyme needs materials to work with. If there are too few substrate molecules, an enzyme simple cannot work properly. Some enzymes can only work if they have another small molecule attached to them. Often, these molecules are metals or charged ions (zinc, iron, etc.). Without them, the enzymes simply cannot take the required shape and form the active site. Many types of enzymes need “fuel” to work. Usually, this “fuel” is provided by taking apart an ATP molecule. Such ATP-dependent enzymes usually have a special part that does just that: destroying ATP molecules to give push to the reaction needed, performed by another part of the enzyme. Usually, there are two types of molecules that can bind to an active site. One type is a substrate – a molecule (or several) that are needed for a certain reaction to take place. But there are also molecules that work like a chewing gum stuck to a working lock. They may not fit fully to the binding site, but they still attach firmly and block the binding of the substrate. If the concentration of inhibitors is higher than the level of the substrate, the enzyme reaction simply does not happen. If you read a scientific article, you are quite likely to know immediately when the author speaks of an enzyme. They usually have specific names that describe what they can actually do. For example, carbonic anhydrase role is attaching hydrogen molecules to carbon dioxide, producing carbonic acid. Carbonic indicates the substrate the enzyme works with and “anhydrase” describes the reaction involved in scientific terms. Enzymes are very important. They help us digest food, destroy unnecessary molecules, make new ones, help us breathe and carry things around. 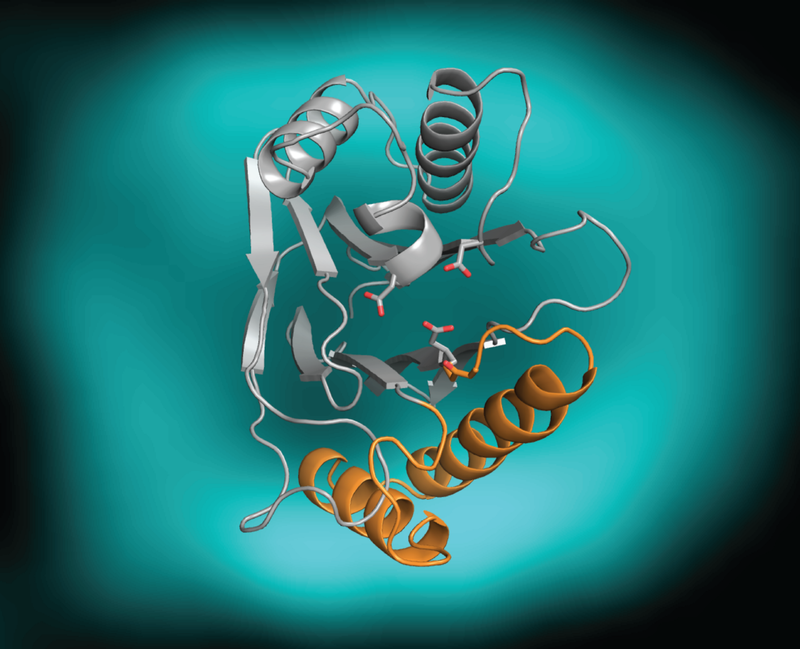 Understanding enzymes are also important for the development of the drugs. By finding the enzyme that can influence the illness and understanding what it works with you can find a proper drug to solve the problem. For example, many medicines interfere with the work of enzymes of bacteria and viruses, thus killing them or preventing them from reproducing. You actually can take care of your enzymes. By eating properly and getting all of the necessary microelements, you provide your enzymes with the co-factors they need. You are preventing your enzymes from denaturing by taking an anti-fever medicine when you are sick (though remember, you have to take it only when the fever is very high and holds for too long, otherwise you will just be in the way of your immune system!). Drinking water when necessary not only keeps you hydrated but also may help to keep up proper pH somewhere. Support your enzymes – they work for you every day without fail!